Meet the Annieglass founder and artist, Annie Morhauser, and hear her stories of how she turned her craft into a national business. 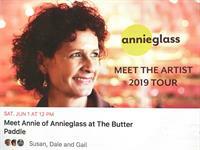 Join Annie at The Butter Paddle for a special in-store event on Saturday, June 1 from 12:00 to 4:00 pm.Complimentary engraving on Annieglass purchases made May 1 - June 1.Enter to win our raffle! Purchase Annieglass May 1 - June 1 and be entered to win an Annieglass serving piece ($200 value).